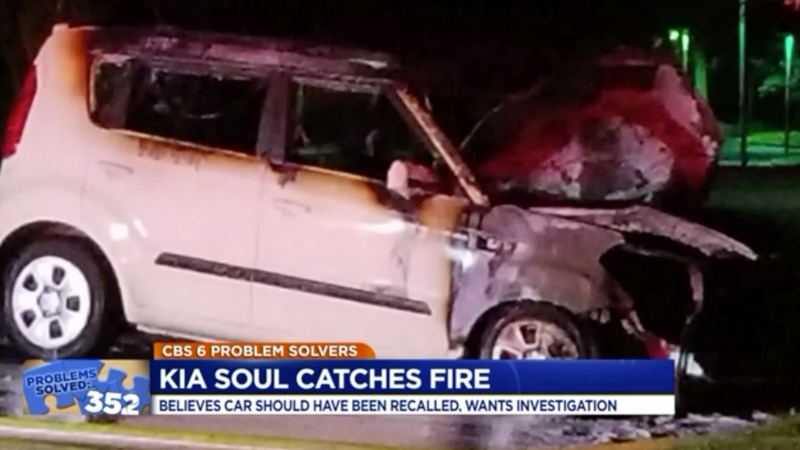 The 2012 Kia Soul that went up in flames with Virginia teenager Bailey Belcher driving it earlier this year. His mother, Michelle Belcher, said in July that she was still on the hook for a large portion of the payments after the fire happened. Hyundai and Kia both recently issued big, and somewhat complicated, voluntary recalls in the U.S. for millions of 2011 to 2018 car models, which have been the subject of hundreds of reports about engine bay fires. Most of the recall, though, is just a software update to alert drivers that their engine might fail. Hyundai and Kia published recall statements on Jan. 16 and Jan. 11, respectively, which cover around 4 million vehicles total. Both recalls are separated into two categories: One for an engine software update, which contains around 2 million vehicles between them both, and a far smaller recall to evaluate the installation of high-pressure fuel tubes to the fuel pump outlet and potentially fix it. The recall to check the installation only covers about 100,000 vehicles per company, but, if installed the wrong way, fuel could leak from the tubes. The software update is a lot bigger in recall terms. The sister companies are calling it a “product-improvement campaign,” where an update to the engine control unit will help it detect connecting rod bearing damage and wear—a topic that’s come up in discussions of the fires in the vehicles’ engine bays. The companies said the update is for a “Knock Sensor Detection System” for the “early detection of engine failure,” which the carmakers said it does by sensing vibrations indicating excessive bearing wear. The system is supposed to alert the driver about the vibrations, and then put the vehicle into “Limp Home Mode”—basically, limp mode with some sentimentality in the name. This will help to reduce further damage to the engine and ensure the vehicle occupants are not exposed to the risk of a more severe engine failure. At that time, a diagnostic trouble code (P1326 – Knock Plausibility) specific to the KSDS will be recorded in the ECU. The vehicle can continue to be operated for a limited time in the Limp Home Mode, but it will accelerate slowly and have reduced maximum speed. Also, engine speed will be reduced to approximately 1,800-2,000 RPM. Hyundai said the software recall includes “approximately 2 million Hyundai vehicles, including all model year 2011-2018 Sonata and 2013-2018 Santa Fe Sport vehicles with engines produced in the U.S.,” and Kia’s update spans nearly 1.7 million Optima, Sorento and Sportage models between 2011 and 2018. All 2011-2018 MY Optima vehicles equipped with 2.4L GDI and 2.0L T-GDI engines; all 2012-2018 MY Sorento vehicles equipped with 2.4L Gasoline Direct Injection (GDI) and 2.0L Turbocharged GDI (T-GDI) engines; all 2011-2018 MY Sportage vehicles equipped with 2.4L GDI and 2.0L T-GDI engines. Kia said it began telling customers about this issue in July of 2018, and that only 20 percent of the affected vehicles have been updated. All 2011-2014 MY Optima vehicles produced from August 12, 2010 to May 15, 2014 that received an engine replacement under Recall No. 17v224; all 2012-2014 MY Sorento produced from April 19, 2011 to February 10, 2014 that received an engine replacement under Recall No. 17v224; and all 2011-2013 MY Sportage vehicles produced from December 30, 2010 to August 30, 2013 that received an engine replacement under Recall No. 17v224. Hyundai’s engine warranty will go from 10 years or 100,000 miles to 120,000 miles for anyone who owns a 2011-2018 Sonata or a 2013-2018 Santa Fe Sport model, but only for “engine repairs needed because of excessive connecting rod bearing damage.” So, basically, it’s your problem after 120,000 miles. Both Hyundai and Kia have be the subject of fire reports and calls to fix millions of vehicles for months now, with the Center for Auto Safety advocacy group petitioning the U.S. National Highway Traffic Safety Administration to investigate the fire claims in certain Hyundai and Kia vehicles in June 2018. In October, the center called on the companies to recall 3 million vehicles for fire hazard, including all Sorento, Optima, Sonata, and Santa Fe models from the 2011 to 2014 model years and all Kia Souls from 2010 through 2015. The center’s press release claimed there had been more than 220 complaints of non-collision fires in the vehicles by then, and almost one per day in the four months before the release, with some complaints saying fires started while on the highway. Hyundai told Jalopnik it already took care of the “only defect trend causing non-collision fires” in two recalls, one from 2015 and one from 2017. Both automakers are notifying affected customers about the recall and the “product-improvement campaign,” telling them to bring their vehicles to the nearest dealership for the software updates and fuel-tube checks. In addition to that, Kia’s announcement said it will reimburse car owners for repair expenses they’ve already made under Kia’s “General Reimbursement Plan” from April.